Flamboyant zoot suit culture, with its ties to fashion, jazz and swing music, jitterbug and Lindy Hop dancing, unique patterns of speech, and even risqué experimentation with gender and sexuality, captivated the country's youth in the 1940s. The Power of the Zoot is the first book to give national consideration to this famous phenomenon. 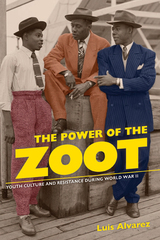 Providing a new history of youth culture based on rare, in-depth interviews with former zoot-suiters, Luis Alvarez explores race, region, and the politics of culture in urban America during World War II. He argues that Mexican American and African American youths, along with many nisei and white youths, used popular culture to oppose accepted modes of youthful behavior, the dominance of white middle-class norms, and expectations from within their own communities. Luis Alvarez is Associate Professor of History at the University of California, San Diego.